Shalane Flanagan finished third, but needed help after finishing as concerned winner Amy Cragg looked on. LOS ANGELES — After Amy Cragg and Shalane Flanagan passed the LA Coliseum for the final time, around Mile 23, the training partners started a conversation. Or, more accurately, Cragg talked and Flanagan mostly grimaced. While the pair was well ahead of the rest of the field at the US Olympic marathon trials on Saturday, it was clear that Flanagan felt depleted by the heat and that Cragg hoped to pull her along to the finish. At one point, Cragg asked Shalane, “Hey, are you OK?” Flanagan struggled to answer, “No, I’m not.” Then, there were a couple times in conversation when Flanagan said, “I’m not sure I can do this.” Cragg worried Flanagan might not make it to the finish. Cragg offered Flanagan encouragement, and kept looking for runners behind them. At Mile 25, Desiree Linden came clearly into view. It was time to make a move. Cragg reluctantly left Flanagan behind, accelerated toward the finish alone, and won the women’s race in 2 hours 28 minutes 20 seconds. With her Olympic berth secure, Cragg immediately turned around and looked for Flanagan. Instead, Cragg saw Linden, who passed Flanagan in the final mile and took second in 2:28:54. Much to Cragg’s relief, a depleted Flanagan soon came into view. Flanagan finished third in 2:29:19 and claimed the final spot on the women’s Olympic marathon team. 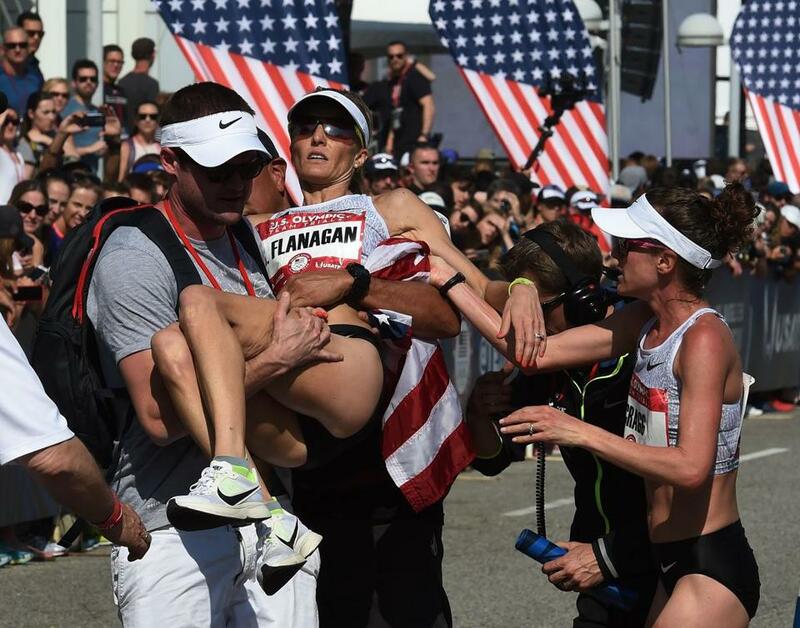 And as soon as she made it across the line, Flanagan collapsed into Cragg’s arms. The dramatic final miles for Cragg and Flanagan were a marked contrast to the rest of the race. Flanagan and Cragg pushed the pace before the halfway mark, covering Mile 11 in 5:31 and opening a significant gap on the rest of the field. They trained together for the trials in Portland, Ore., and Flagstaff, Ariz., and looked extraordinarily comfortable running side by side. It was as if they were out on one of the many long runs they did in preparation for Saturday’s race. By the halfway mark, it appeared Flanagan and Cragg were locks for the Olympic team with the real competition destined for the third and final spot. After what she described as a “devastating” fourth-place finish at the 2012 marathon trials, Cragg didn’t want to leave anything to chance on the streets of downtown Los Angeles. By Mile 17, Cragg and Flanagan held a 54-second advantage on Linden, and Linden enjoyed an 11-second gap on Kara Goucher. In 2012, Goucher beat Cragg for the final Olympic berth in the women’s marathon. But Linden was simply staying patient and saving energy for a strong finish. Linden also knew that the heat would be more difficult to deal with during the second half of the race. At the start it was 65 degrees, and it climbed to 73 when most runners neared the finish. So, Linden was content to steadily gain ground on Cragg and Flanagan over the last 6.2 miles. Meanwhile, as Linden cramped up, yet closed in, Cragg grew increasingly worried about Flanagan. But Cragg did know that few marathoners come tougher than Flanagan, who entered the trials as the favorite. Now, Cragg, Linden, and Flanagan will take some time off, then begin the buildup for Rio, where they could face equally hot conditions. Shira Springer can be reached at springer@globe.com. Follow her on Twitter @ShiraSpringer.